Filmmaker and curator Jonas Mekas (b.1922), one of the central figures in American avant-garde cinema, and his brother Adolfas (1925-2011), who would also become a filmmaker, fled their native Lithuania in 1944 due to the war. On route to Vienna, they were detained in a labour camp in Elmshorn, near Hamburg; eight months later they escaped and hid on a farm near the Danish border until the end of the war. They then lived in a series of displaced persons camps in Germany. In 1949, the brothers arrived in America and began their prolific film practices. For Jonas, these would be driven by a desire to hold on to fragments of his life as he passed through it and it passed through him. His film diaries flutter with single frames and short gestural sequences of gatherings, landscapes, family, and friends — what he calls little moments of paradise. He considers this yearning to be the fate of displaced persons, whose every living moment contains a past they are afraid they can never return to. 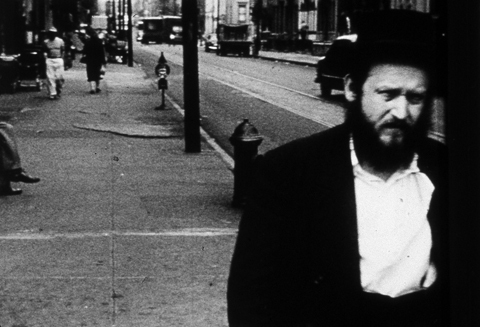 Reminiscences is structured in three parts, recounting the Mekas’ early days among Lithuanian immigrants in Brooklyn (1950-1953); their homecoming, after 27 years, to the village of Semeniskiai in Lithuania (1971); and their journey to Elmshorn, where they were interned, and then to Vienna, where they spend time with close friends Peter Kubelka, Hermann Nitsch, Annette Michelson, and Ken Jacobs. Reminiscences does not picture Lithuania as it was in 1971. Rather, it was shot through the eyes of a displaced person who has returned looking for the paradise of his memory. Color, 16mm, 82mins.